I wish to express a personal thank you to all the men and women who are serving and have served the armed forces of this country. The water level is falling at what is suppose to be the beginning of rafting season. The water level at the upper Kern was measured at 1,910 square feet per second; this is probably the last good weekend to raft up here. 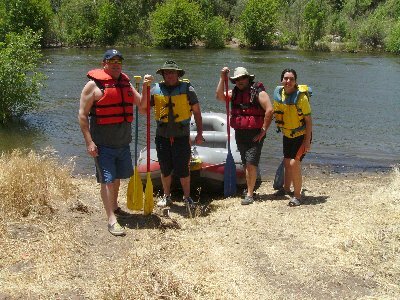 Jane, Professional Debriefer Paul, Jeff W., Instructor John and myself set out to do four runs from the Powerhouse rapids to Frandy campground. 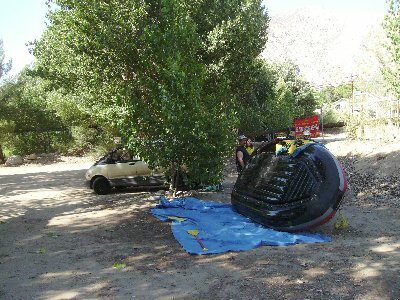 The Kern River death count still read 242 – they apparently are no longer updating the sign. 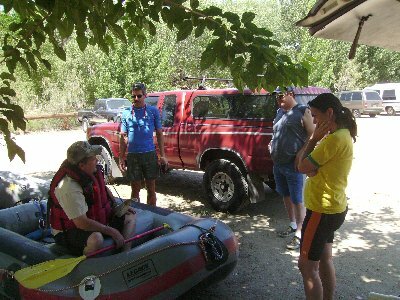 John gave his safety and procedure lecture to refresh Paul’s memory on how to raft – he had not been rafting for almost 30 years. 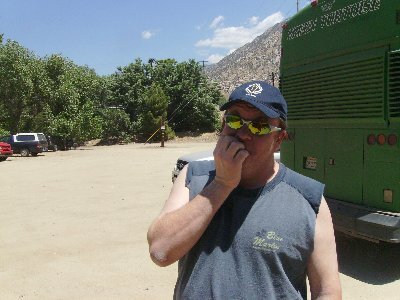 Paul was so nervous, he started biting his fingernails off. The first crew is ready to go – from left to right, Debriefer Paul (who actually is shorter than me), Me, Instructor John and Jane. We made it through the Powerhouse rapids. 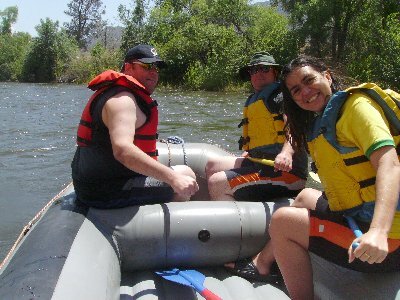 I don’t have any really exciting rafting pictures on this trip – the professional photographers were apparently so burned out from the Memorial Day weekend, they had packed up and left by Monday afternoon. 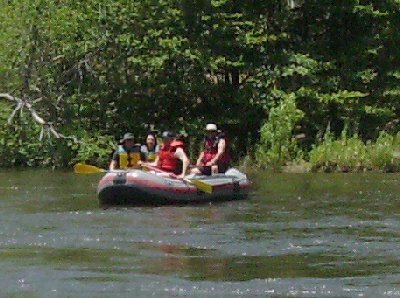 We made it through the first run without a problem, even though the raft was lopsided on power with only three paddlers and the guide. On the second run, Jeff W. switched with John; John ran shuttle. The back of the boat from my perspective. The front of the boat from Jeff’s perspective. The second run was flawless – a real nice ride! Jane complimented Paul and I for blocking the water so she wouldn’t get so wet. The third run went smoothly as well. 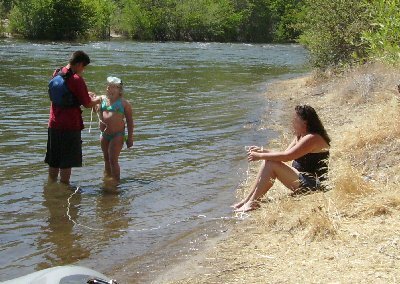 A young girl who apparently couldn’t swim, but desiring to play in the river, was tied with a string around her arm with the other end held by an adult – probably her mother. “She doesn’t know how to swim, so I want something to pull her back up to shore,” she told the other person in her party. The water level had fallen since the first couple of earlier runs in the day, but the fourth went smoothly and without incident. 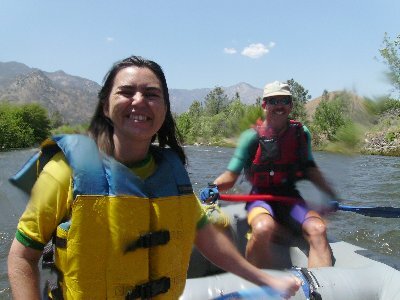 Another day of rafting comes to an end. 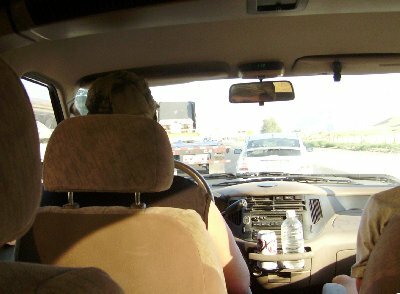 We hit Memorial Day traffic coming back in to Los Angeles; with a few shortcuts on side roads by Magic Mountain, we still got home in decent time. 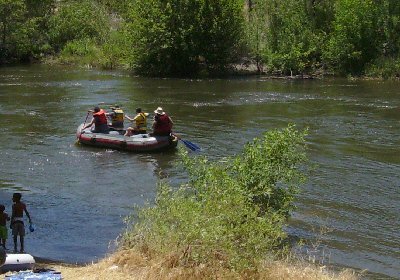 Apparently, there were two water rescues today above the Powerhouse rapids by the Fire Department; we were not provided any details.